← How to make the converted image files to an appointed folder by Image2PDF OCR? 1.What is jp2 format file? JPEG 2000,with the extension name .jp2 is an image compression standard and coding system.You can think of it as the next generation of the more commonly known JPEG file format. In principal, it's very similar to JPEG in that they are both compressed image file formats.But JPEG 2000 has a much more significant advantage over certain modes of JPEG: artifacts are less visible and there is almost no blocking. The compression gains over JPEG are attributed to the use of DWT and a more sophisticated entropy encoding scheme. 2.Which software can be taken? When you needs to do some work with the help of some kind of software,you should choose a high cost effective one which is low in price,fast in speed and easy in using.So now you can pay attention to the software HTML Converter Command Line which can be downloaded at http://www.verypdf.com/htmltools/htmltools.zip. 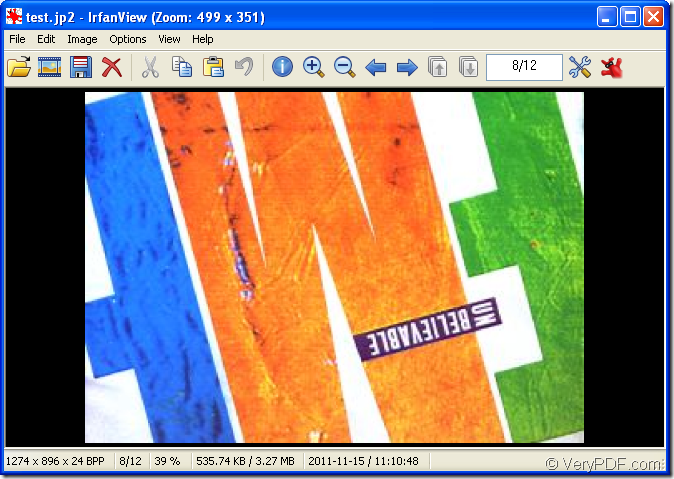 It is a powerful HTML conversion software which allows you to create previews or thumbnails of web pages in a number of different formats, such as TIF, TIFF, JPG, JPEG, GIF, PNG, BMP, PCX, TGA, JP2 (JPEG2000), PNM, etc. HTML Converter Command Line also allows you to convert web pages to PDF, PS (postscript), WMF, EMF vector formats. After downloading HTML Converter Command Line,you should unzip it to some suitable location in your computer first,then register it.Please click “start”—“run” and input “cmd” in “open” edit box to run cmd.exe dialog box.Change the current directory to the installation directory of HTML Converter Command Line by DOS command “cd” and input the register code which you get when purchasing the software online.End with “Enter” button on the keyboard.Please see Figure1. 3.How to rotate the page when converting emf to jp2? You should input the command line in cmd.exe dialog box.If you didn’t close the cmd.exe dialog just opened,you can continue to do the next step.Or you should open it again by the way mentioned above.You can also use the quick way—pressing the hot key “Windows”+ “R” to realize the same function. The command line in the conversion of emf to jp2 contains called program,parameter,source file and target file.Please see the following basic structure. htmltools.exe is the called program in this conversion.It is the executable file in HTML Converter Command Line.You can see the file in installation folder of HTML Converter Command Line. –rotate value(can be set as 90,180 and 270) is the parameter to set the rotation angle. “input.emf” is the source file you want to convert. output.jp2 is the target file you want to get. The example below will help you to understand the structure above better. "C:\Documents and Settings\admin\Local Settings\Temp\htmltools\htmltools.exe" is the path of htmltools.exe which is the executable file in HTML Converter Command Line.If you don’t want to input a so long path,please drag the file into cmd.exe dialog box directly. -rotate 90 stands for the rotation angle has be set as 90°.The source file will rotate 90° along clockwise direction. "C:\Documents and Settings\admin\Desktop\New Folder\test0001.emf" is the path of source file. test.jp2 is the name of target file,including file name and extension name. Then you can find the target file in current directory.We can make a comparison to the source file and target file.You will find the source file has been rotated 90° along clockwise direction.Please see Figure2 and Figure3.Then the conversion of emf to jp2 is over. 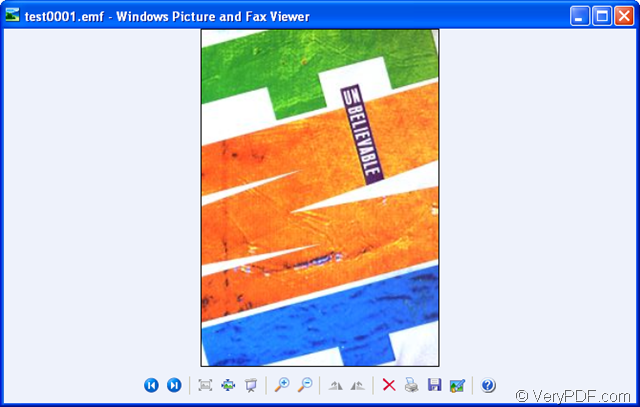 How to convert a document of mhtml to bmp image? How to rotate the page when converting WMF to TIFF? How to convert a document of html to tiff image?